If you are focused on finding a safe, low impact workout that delivers great results you need to get on a bike. Cycling indoors on a stationary bike is a low impact exercise that burns calories fast – all in a controlled environment. The hazards you might imagine with outdoor cycling on the road are safely removed which allows you to concentrate on making the most of a safe workout in a comfortable environment. It’s sensible to avoid high impact, jarring movements if you are recovering from injury or taking care with your joints. Solid surfaces like concrete and hard court can be punishing, particularly if you are running or jumping as you exercise. You need confidence that the workout you choose is safe. Focusing on safety doesn’t mean you need to miss out on all the fun though. 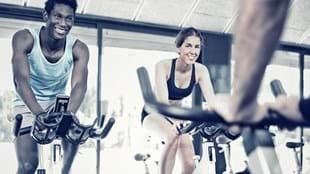 An indoor cycling class delivers an impressive cardio workout. It increases your strength and endurance ability, while being kind to your joints. Cycling workouts are designed to deliver a challenge to the individual. You set your own pace within the class environment. There is no floor impact for your joints to absorb, just smooth motion on the pedals. This means you can focus on safely building up your fitness levels with regular session attendance. Cycling indoors is a very different proposition to road cycling. Cycling on the road can feel like a battle. Outdoors you need to be conscious of traffic, other cyclists, even your own balance on the bike. All those distractions and hazards are removed indoors. You also have the benefit of a trained instructor. Every element of a cycling class has been carefully designed so that you can gain the most results. Safely. RPM™ Program Director Glen Ostergaard says when you are starting out make sure you talk to your instructor and get them to help you set up. “Bike set up is key so that you’re comfortable and you enjoy your first ride.” Glen also suggests building up gradually toward a full class, using light resistance at the beginning. Being able to work out alongside others is a great motivating factor. Riders of all fitness levels can be challenged within the same cycling class. You gain the motivating benefits of a group atmosphere – but with no need to worry about being left behind at the bottom of the hill. It’s time to get on that bike.